Located about 20 minutes south of Whistler Village, Pine Crest and Black Tusk offer affordable single family dwellings in a quiet, well-established gated community surrounded by natural forests, creeks and lakes, with amenities such as a community centre, tennis courts and a Whistler school bus for children. Close to the Olynpic Callaghan Valley Nordic Centre and trails and some world famous hiking, including Garibaldi Lake, Panorama Ridge and Black Tusk. Function Junction is primarily known as the light industrial area about 9km south of Whistler Village. Home to a variety of retail, service and commercial businesses, Function Junction is an essential part of how Whistler operates. On the opposite side of Highway 99 to Function Junction, Cheakamus Crossing is a new, self contained residential community. Originally used to house the 2010 Winter Olympic and Paralympic athletes, Cheakamus Crossing has been designed with sustainability and the community at the forefront. After the 2010 Winter Olympic & Paralympic games, many townhomes and condos were re-fitted for Whistler families and the complex provides affordable housing for employees of the Whistler community. One of Whistler's newer neighbourhoods, Spring Creek is located 7km south of Whistler Village. Home to Spring Creek Elementary School, a playing field and playground, this neighbourhood is a popular choice for families. Boasting exquisite chalets along Tynbridge Way and Khyber Lane, high-end townhomes at The Glades and the beautifully appointed employee housing townhouse complex, Bear Ridge. A peaceful community with parks, tennis courts and access to many lakes, Bayshores is just 1 minute south of Whistler Creek and the gondola for Whistler Mountain. Access to the Whistler Valley Trail system makes commuting around Whistler enjoyable and easygoing. Spring Creek Elementary School is within walking distance, making it popular among families. A variety of townhomes, duplexes and chalets make up this neighbourhood. Boasting it's own private gondola, Kadenwood is a luxurious development just above Bayshores, providing spectacular views and ski-in/ski-out access to Whistler Creek. With only 60 lots, this is a truly exclusive community of large, high-end homes. There are a few building lots still available, enabling you to build your dream home and take advantage of the expansive views. Prior to the development of Whistler Village, Whistler Creek was the original town site and home of the first lift access up Whistler Mountain. As you arrive from Vancouver, Whistler Creek is the first place with access to the mountain. A village in itself, Whistler Creek is home to a grocery store, liquor store, gas station, hotels/hostels, bars, restaurants and cafe's, and boutique shops. The extensive Valley Trail system connects you seamlessly with the village as well as many local parks, lakes and biking trails. Whistler Creek offers a wide variety of housing options for every need. Rustic cabins, townhouses, duplexes, timeshares and Whistler employee housing make Whistler Creek an eclectic neighbourhood for all to enjoy. Just north of Whistler Creek and 4km south of the Whistler village lies Nordic Estates, one of Whistler's largest and most diverse neighbourhoods. Luxury ski-in/ski-out homes on the Dave Murray Downhill are the only ski-in/ski-out properties outside of Kadenwood and the Blackcomb Benchlands. Easy public transport access to the main village and walking distance to the amenities of Whistler Creek, Nordic Estates makes Whistler living easy. Westside refers to all of the homes along Alta Lake Road, which tracks around to the west of Alpha, Nita and Alta lakes. Alta Lake Road connects Whistler Creek to Alpine Meadows, providing access to Nita Lake Estates and Stonebridge along the way. The majority of the homes in this area have spectacular views across the Valley towards Whistler and Blackcomb Mountains. Many homes benefit from private docks giving direct access to Alta Lake, where the popular Rainbow Beach can be found. Nita Lake Estates boasts spectacular new homes on acre plus lots and is only a short walk from the Creekside Gondola. 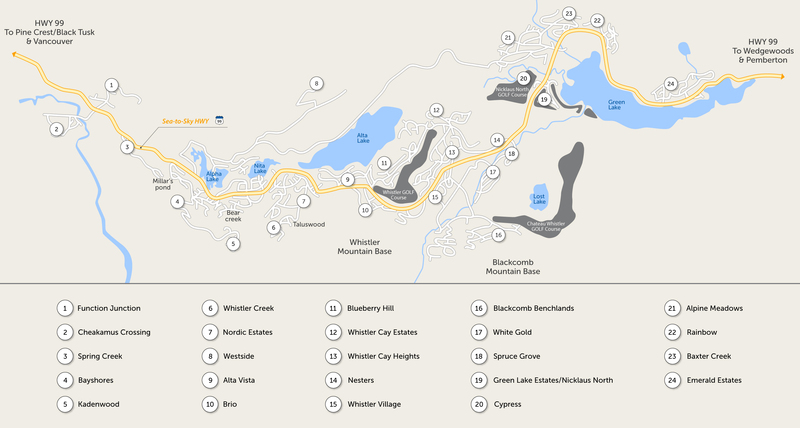 Stonebridge offers some of the largest estate lots in Whistler, ranging from 1 to 20 acres. Exclusivity, tranquility and sprawling views abound.